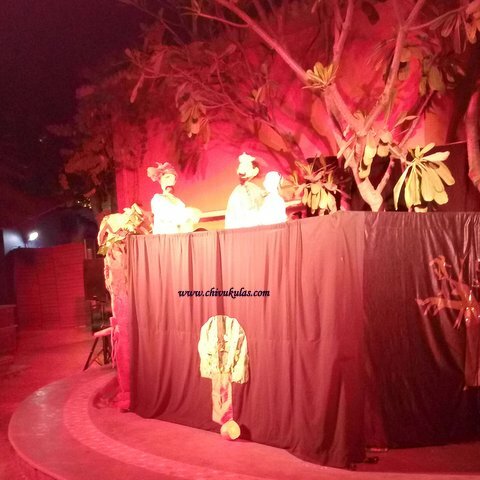 A Wonderful Puppet Show on Vikram and Bhetal at Saptaparni, Hyderabad. Well, it wasn't an All Fool's Day for us on April 1st this year. 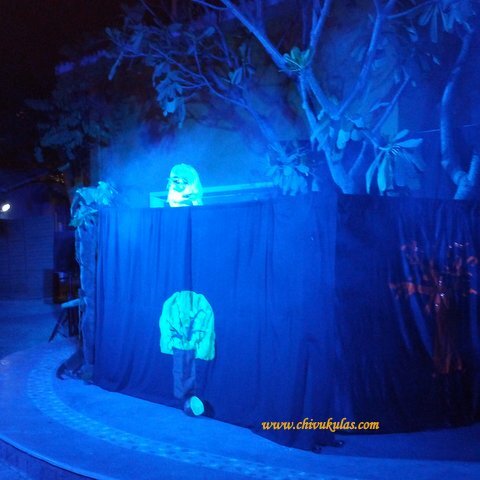 On the other hand we got a chance to watch a wonderful puppet show at around 7 p.m at Saptaparni in Road No. 8, Banjara Hills, Hyderabad. My 6 years old daughter who is in 2nd Std is learning carnatic classical music at Saptaparni. So we got the chance of viewing the puppet show on April 1st, 2016. This was the first time my daughter watched a traditional puppet show and was really thrilled particularly with the lighting effects and the appearance of ghost puppets. Believe me, she was a bit scared with the realistic sound and light effects of ghost scenes. Before going to bed that night, she told me that Bhetal may come in her dream. I convinced her saying that Bhetal is not an evil ghost but he is a good ghost and helps good people, the way he helped King Vikramaditya. I told her that you are a good girl and even if Bhetal comes in your dream, he will help you. So not to worry. She got much convinced with my words and had a sound night sleep. The wonderful puppet show was organized by Nori Art and Puppetry Centre (NAPC), Hyderabad. 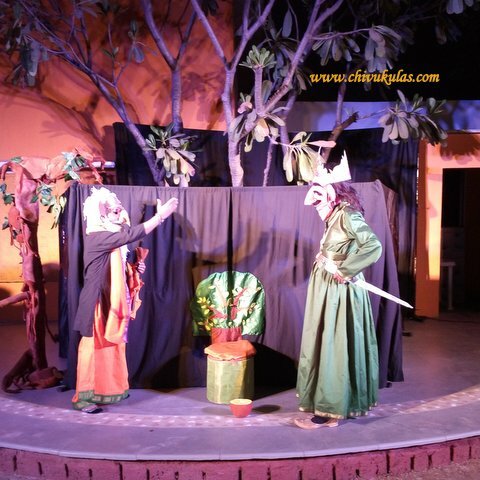 It is a registered voluntary organization founded by Smt.Ratnamala Nori who organizes / conducts various puppet shows, programmes, workshops and training along with her troupe of puppeteers. She has several awards to her credit like the prestigious Nandi Award (Andhra Pradesh state govt award), Ugadi Puraskar, NCERT award and many more. The show started at around 7 p.m and by the time there was good gathering of audience that include both parents who accompany their children to Saptaparni for learning various fine / performing arts and outsiders too. 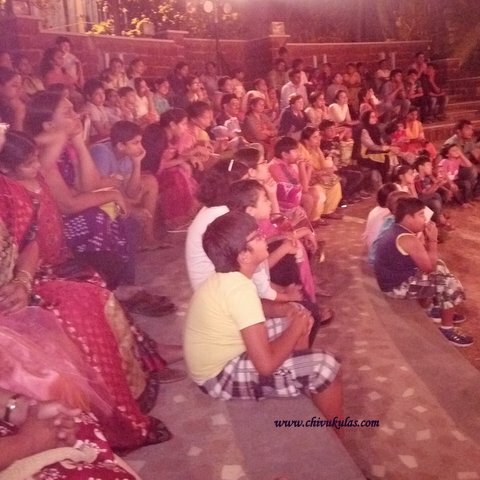 Children were curiously waiting for the show to begin and they were too happy and excited as the show has begun. Many children smartly answered the questions by the puppeteer Smt. Ratnamala when she was giving an introductory speech before beginning the show. Two stories from the popular stories of Vikram and Bhetal were showcased. Parents /adults too equally enjoyed the show along with their children. And I am sure, it would have been nostalgic for the adults who might have lost in the memories of their children days when they happened to view such puppet show along with their parents. It was almost a one-hour show which was spell-bounding and captivating. Such traditional shows need to be encouraged by the public and the govt as well. Lest these might gradually fade away because of the dominating silver screen movies and small screen programmes. These traditional shows are healthy and environment-friendly. Children in general and underprivileged ones in particular are much inspired and motivated by such traditional shows of India. It would be really nice if the present generation parents get their children for such lively and interesting traditional shows. This would not only help in having a healthy growth of the children but it would be encouraging for the traditional puppeteers too. Revive the age-old traditional practices of India for a healthy and eco-friendly living. Thank you Ratnamala. Yeah, I had already shared it in FB.